A model of 1841 10-inch Seacoast Mortar, recently completed by South Bend Replicas, Inc. for the State of Georgia, will be on permanent exhibit to the visiting public at Fort McAllister in the near future. 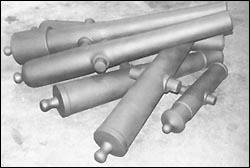 The mortar, with a muzzle diameter of 27.5 inches and trunnion diameter of nine inches, is reliably presumed to the the type to have fired the opening shot of the Civil War, against Fort Sumter. With no originals of the piece remaining in existence, the reproduction was made from archival dimensions supplied by historian Edwin Olmstead of Pennsylvania. Pile of turned lathe guns, 1840-1860, for Fort Pillow, TN. Russian 3-pounder Unicorn, St. Petersburg, 1804, for Sutter’s Fort, CA. Guns for Fort Conde, Mobile, AL. Confederate 6-pounder for city of Rome, GA.
3.67″ Parrott for the Paulson Brothers. 2.6″ Wiard Rifle for the Paulson Brothers.